He made his debut in 2010 in Australia in the test that followed the infamous Sydney test. He played just that one test due to the immense public pressure to oust Kamran Akmal, and then disappeared from the international scene for 3 years before returning again in 2013 for the 3 tests in South Africa. He played those 3 tests, on wickets where most Pakistani batsmen failed, and managed a top score of 40 in his 6 innings leaving question marks over his batting abilities. He was axed again and didn't play for another year, till he was recalled to replace an injured Adnan Akmal in the second test of the series against Sri Lanka in the UAE earlier this year. Since then, Sarfraz Ahmed has not looked back. It has been a marvellous year for him and he has marched on like a man on a mission. For a man whose batting was doubted by everyone around the world, Sarfraz made one hell of a turnaround to notch up scores of 7, 74, 5, 48, 55, 52*, 103, 55, 109, 15*, 19*, 13*, 112, 24* in 8 test matches in 2014. This year, Sarfraz has scored 691 runs at an average of 76.77 and a strike rate of 73.12 in 8 tests! Those figures include feats like the fastest century ever scored by a Pakistani wicketkeeper, the second fastest century ever scored by a wicketkeeper, and the only Pakistani wicketkeeper to score three centuries in a calendar year. Only AB De Villiers has scored more centuries (4) in a calendar year as the designated wicketkeeper of the team. Sarfraz' batting has been a revelation and he has been a major factor towards Pakistan's success in test cricket this year. He is only 12 tests old, yet he has already left a mark on the cricketing map and is fast gaining the reputation of being Pakistan's best wicketkeeper-batsman ever. 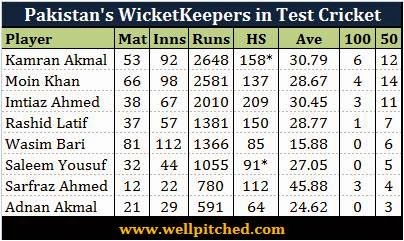 There are 8 wicketkeepers who have played at least 10 tests for Pakistan in the history of their test cricket; and as far as their batting prowess is concerned, there haven't been any better than Kamran Akmal and Moin Khan. Kamran and Moin lead the runs rally for Pakistani wicketkeepers in tests and both have a similar average as well. It can be argued that Kamran was slightly better considering he has 6 test centuries (no wicketkeeper from Pakistan has scored more), with some match winning ones. Sarfraz, with 3 test centuries is already half way there; and the way he is batting, he could well be above Kamran in just another year. Sarfraz' test average of 45.88, which is 15 runs better than Pakistan's best ever, already shows his superiority with the bat. No one among all test wicketkeepers in the world comes close to making the impact that Adam Gilchrist and Andy Flower made with the bat. Sangakkara and AB De Villiers could have had they continued to keep in test cricket; however if Sarfraz can sustain his current form in the long term, he will undoubtedly be remembered among the greatest wicketkeeper batsmen in test cricket ever. 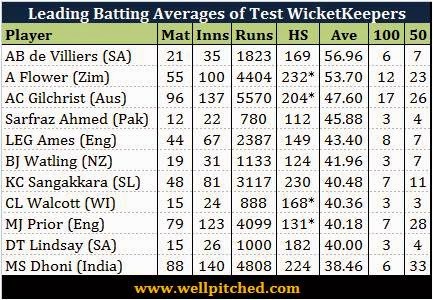 Among his global peers, Sarfraz is right up there in terms of his batting average in tests, among all wicketkeepers who have played at least 10 tests.